An Automatic Watering System for Your Pet. Cats and Dogs know by instinct that running water is fresher than standing water. This is why the Drinkwell Fountain is so great. It is the original pet fountain and is designed, approved and recommended by veterinarians. It is perfect for any small dog or cat, but particularly beneficial to those prone to urinary tract infections. Your pets can see and taste things in their water bowl that make them prefer water dripping from a faucet or flowing in a stream over the stale, stagnate water in their bowl. The Drinkwell system aerates and cleans water while simulating the flow of natural running water. This continuous flow of water is filtered with each cycle, so your pet will always be drinking clean, fresh water with little contaminates in it. Give your pet cleaner, better tasting water while preserving your sinks, bathtubs, and showers from having stains due to a from constant running water. It also discourages them jumping on counters or in bathtubs! The Drinkwell Pet Fountain uses an innovative watering system featuring a patented free-falling stream of water. A large charcoal filter removes bad tastes and odors giving your pet the best possible and most appealing way to stay hydrated. Simple, safe and proven to benefit your pet's health. The Drinkwell Pet Fountain is a great way to show your pets just how much you care. Research shows that one of the best ways to improve your pet's health is to get them to drink more water. And the best way to do that is with the Drinkwell Pet Fountain. By using a 5-inch falling stream of water, it will continually add oxygen to your pet's water while clearing it of harmful particles. This fountain is one of the best ways to get your pet to drink more water and improve their overall health. While most people are aware of the human benefits of drinking enough water each day, many likely overlook the intake needs of their pets. Water is an essential element for both humans and pets alike, yet getting enough H2O can be challenging especially for our furry friends that prefer free-falling water to stagnant water in a traditional feeding bowl. As a caring pet owner, there is a solution to better ensure the proper hydration of your pet - it’s Drinkwell The Original Pet Fountain. The Drinkwell Fountain is designed, approved, and recommended by veterinarians, particularly for pets prone to urinary tract disorders. This fountain will save trips to the vet by giving your pet this innovative constant access to running water. Drinkwell is especially beneficial in cats with kidney or urinary tract disease. These cats have a critical need for water to support kidney function or prevent crystal formation and obstruction. It satisfies a pet’s preference for running water and need for proper hydration, while also serving as a convenience product for owners. The Drinkwell Fountain takes just minutes to install. Just fill the Fountain with water, place it in desired location, and plug it in. Once running, you can adjust the flow rate to your desired rate by using the convenient flow adjustment lever. That's all it takes for your pet to enjoy clean water on a regular basis. You will also notice that it runs very quietly. All you will hear is the sound of running water because it is quieter than most faucets when they are left running. Maintenance is easy too. The included filter and the replacements are reusable. Just rinse and replace for up to 8 weeks of use. The high quality charcoal filters remove bad tastes and odors, for fresher water your pet will want to drink. This fountain holds six cups of water. With the optional 50 oz Reservoir Attachment, the capacity doubles to twelve cups. Get even more capacity when you choose the 70 oz Reservoir Attachment. This size fountain is perfect for smaller dogs and cats. If you have a larger dog you might want to check out the Big Dog Drinkwell Fountain. It has a larger bowl and a higher overall capacity. Dimensions 9" x 11.5" x 7.5"
Drinkwell Pet Fountain - Your pet will love this automatic watering device. 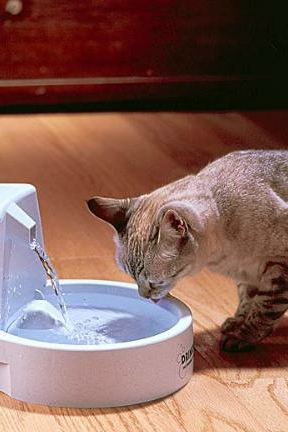 Get this clever little water bowl to ensure your pet is drinking clean, fresh water at all times. 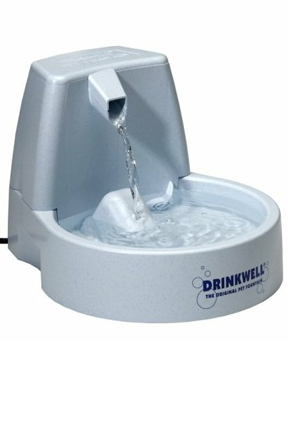 The Drinkwell Pet Fountain is a favorite of pets and owners alike. Have a happier and healthier dog or cat with this great fountain. Order Yours Today! My vet recommended this for my male cat who was constantly at the vet for urinary infections... she said more water = less infections. I didn't believe her at first but I do now, my beloved furball has not been to the vet for this problem in 5 years. He loves the fountain and drinks a lot more water. It is a pain sometimes to clean, and the filters are expensive but for what it has saved me in vet bills, it's well worth the effort and has paid for itself many times over.